It’s probably safe to say that if you really want to get to know a city, stay away from where the scenic beaches and high-rise hotels are located. Far from the pulse of the city, these upscale, over-developed, tourist-friendly locales not only attract the crowds of tourists you’re likely trying to avoid in the first place, but also house the bland restaurants and petty criminals that are attracted to this vulnerable crowd. Instead, look for the neighborhoods with the street vendors, with the businesses where the owners sit out front chatting with neighbors, with the restaurants that don’t even bother putting their name out front. Here’s is where you’re going to find the “real” city, not to mention a better time. And, like many other places around the world, this is also true for Recife, Brazil, the country’s fourth-largest city, and home to one of the region’s most visited beaches, Boa Viagem beach in the tony neighborhood of Boa Viagem. 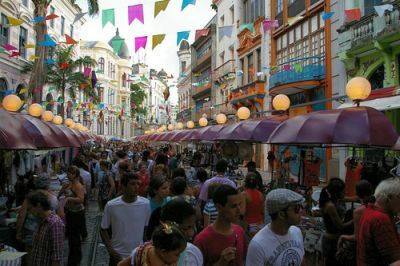 But, as Travelmag points out in a recent trip to the city, a trip to Boa Viagem isn’t really Recife. In fact, “Boa Viagem could be almost anywhere in Brazil, or even Florida [gasp! ].” Instead, they suggest heading downtown, an area once flush with money during its colonial heyday as a major exporter of sugar. Of course, that was several hundred years ago, and things have changed. Such wealth is long gone now, and much of today´s downtown Recife is a faded, crumbling relic. But not only that – it is a city that pulses with human life. There are people everywhere, whether buying fruit and vegetables, fresh mamaõ and macaxeira brought in that morning from the parched countryside, or talking, for recifenses love to talk as much as they love to do anything, or eating, which is the one thing recifenses love to do more than talk. I wonder what our friend, Thomas Kohnstamm, had to say about the city during his infamous trip there researching the Northeast for Lonely Planet’s Brazil guide? Turns out he liked it, noting its “rich traditional side” and its reputation as home to “some of Brazil’s best folk art, including paintings and sculpture, dance, music and festivals.” And even he has some reservations about Boa Viagem. Disappointed that “very few people actually enter the water,” he recommends (or somebody did) heading south about 14 km to Praia Enseada dos Corals, Praia Gaibu, and Praia Calhetas for cleaner water. And fewer high-rise hotels, always a good thing.